On a sleepy afternoon, I was running through my Twitter timeline, when I caught sight of something very interesting. A book-in-every-hand initiative by Pratham Books. As someone who feels fortunate to be introduced to books as a child-and who always saw her parents and most in the family reading, it came to me, almost like second nature- this initaitive had me hooked. I have taught children from several strata of our society; children who have not had it fair, and so on. So books and children, two creations of the Maker, very dear to me...and "what can I do", it had me thinking. And as they say, it is not the magnitude, but the very act of having done the deed that matters the most. Each one of us can make a difference, in our own small ways. 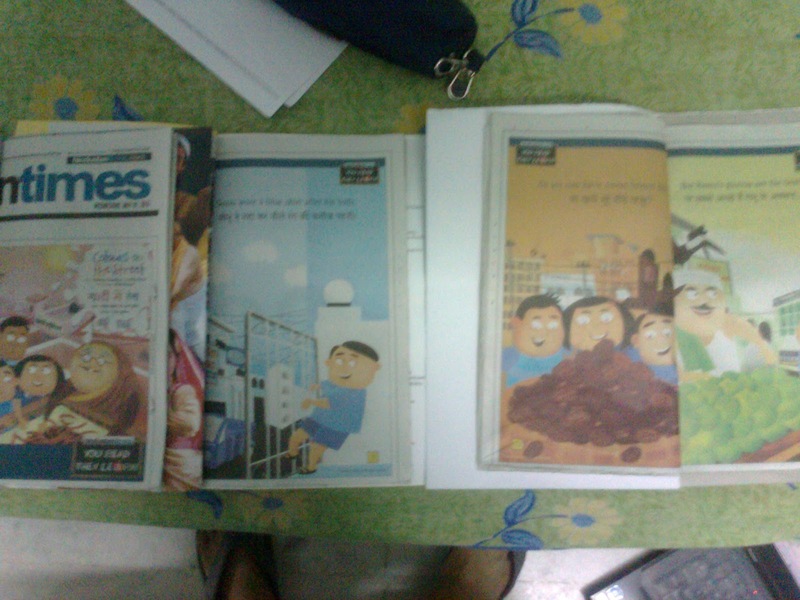 So here I was, with four books (cut out from today's edition of Hindustan Times) ...here is what they looked like- after i added a cover to each. While I have three books with me, here is what the first one (Book 1- for ease of ref.) achieved. Planning to share what becomes of the other three books. If you have that copy of HT lying somewhere in your house, may be you too want to do something about it. Book1: Given to my maid. Narrated the story to her. In her late teens, she is a class 4 drop out. Big smile flashing upon her face. eyes gleaming. Spreading the joy: She will hand them over to her bua's (father's sister) children. this, after she narates it to the children in her locality--- her cousins go to school and she says she will in turn get them to narrate it to other children in their school, and with whom they play in the park! I so do Hope, this happens...she said it like she means it.